I’m slowly realising what a monumental can of worms I’ve opened for myself, as my “to taste” coffee cupboard is starting to look a little like my equivalent beer and whisky cupboards. Happily, this means I’m drinking a whole lot more tasty coffee than before, when I would often (don’t tell anyone) just default to a mug of instant. 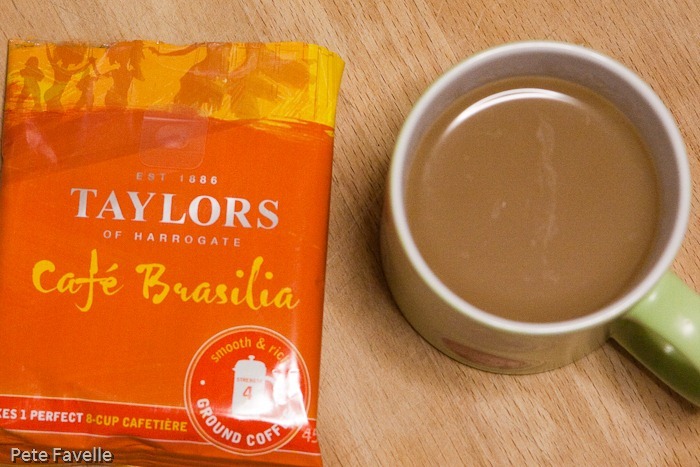 Today’s coffee is Cafe Brasilia, a strength 4 coffee from Taylors. The grounds have a warm, rich nose with a hint of dried fruit, and even a slight edge of nuttiness. It’s clearly had a fairly gentle roasting, the aroma lacking even a suggestion of that cooked, caramel nature you can get with darker coffees. Brewed, the aroma is even more gentle – it’s still warm but less rich and fruity, with an underlying nutty character. There’s a decent medium body on tasting; it’s not in any way a strong coffee, but there’s enough of a richness to avoid being weak and watery. The bitterness is subtle; present enough to give a well rounded character without being obvious or aggressive. It’s a little lighter than I like my coffee, but well balanced and very drinkable. At 7.5 out of 10 it remains one of the highest scoring coffees at work, and it easily earns 3.5 stars here.